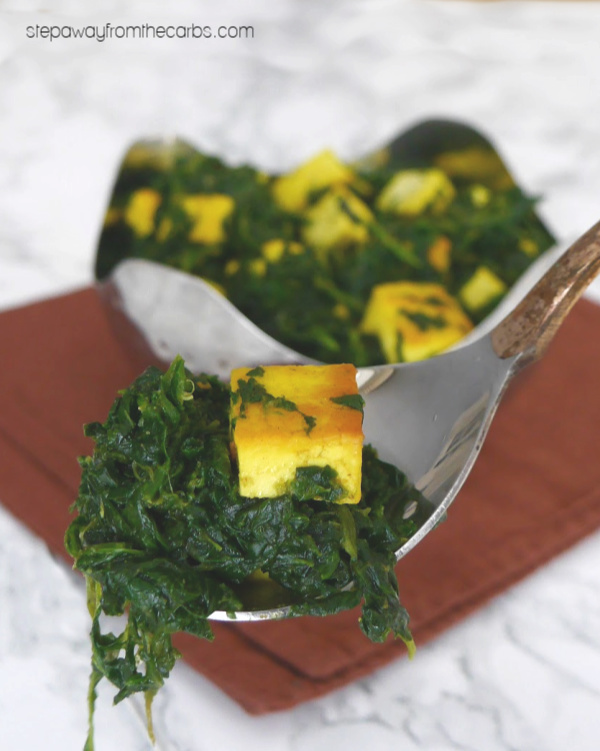 This low carb Saag Paneer is a wonderful Indian side dish made with spinach and a traditional firm cheese called paneer! Keto, gluten free and LCHF recipe. I used to do a lot of Indian cooking back in the UK – but since moving to the US nearly ten years ago (!) I haven’t been able to find the ingredients so easily. But I’ve still been able to make quite a few low carb versions of my favorite Indian dishes! I hadn’t been able to buy any paneer until I saw it recently in Costco – a 2lb block which is more than I needed but I’ll use it up somehow! Saag paneer was the perfect recipe to try first! 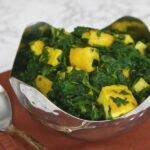 Saag Paneer is one of my favorite Indian side dishes. 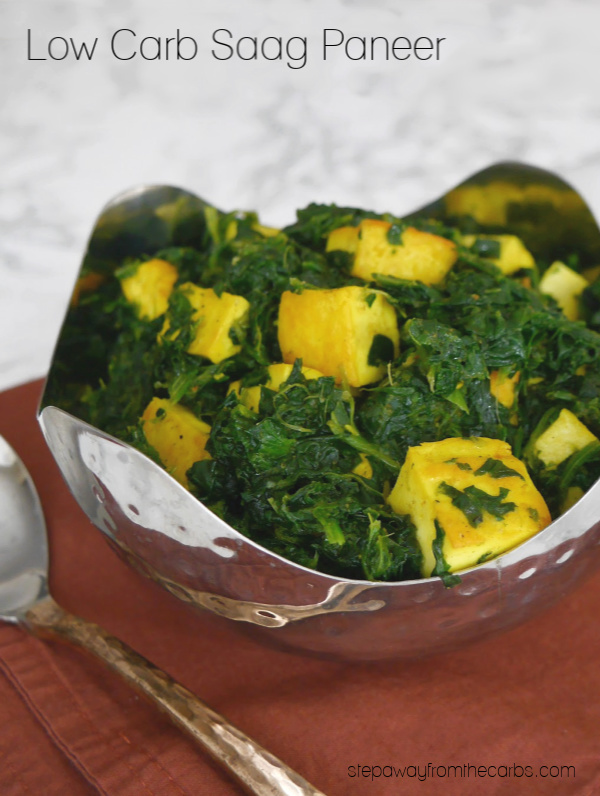 The saag (usually spinach, but can also be mustard leaves or other greens) is sautéed in a blend of spices, and then finished with fried paneer. Paneer is a firm, unaged cheese that doesn’t melt. It provides a great contrast to the soft spinach! Start preparing the dish by dicing the paneer into bite sized pieces. Note: I cut them up smaller after taking this photo! Place the cubes in a bowl, and add turmeric and salt, then mix well. I probably used a little too much turmeric, but I made this on a dull gray day, and the pop of bright yellow was actually very welcome! Heat some oil in a large skillet and add the paneer. Cook, stirring frequently, until a few of the sides of each cube have turned golden brown. It actually doesn’t matter if it’s not evenly cooked! 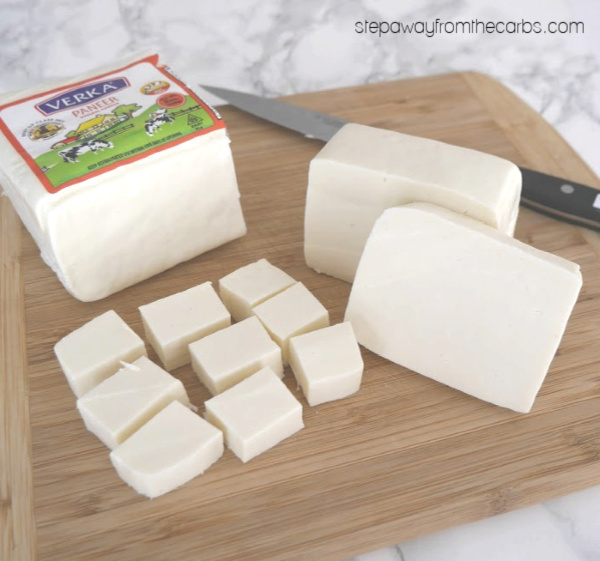 Remove the paneer with a slotted spoon – keeping the oil in the pan – and transfer the cubes to a bowl. Set aside. Add more oil if necessary, then prepare the spice blend by adding garlic paste, onion powder, ground cumin, and garam masala. Cook for a few minutes, stirring frequently, then add some water to make a loose paste. 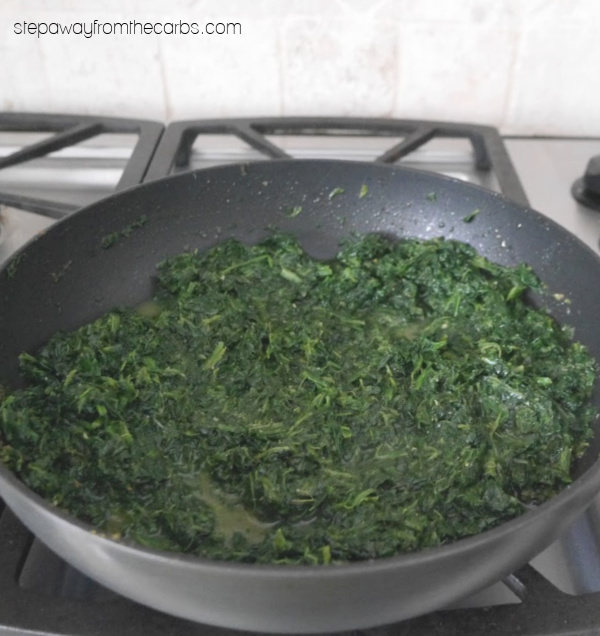 Add two boxes of chopped frozen spinach, and reduce the heat to low. Let the spinach defrost, stirring as it thaws. When the spinach has fully defrosted, turn up the heat and boil off any excess liquid. Taste for seasoning and add salt and pepper. You’ll probably need a lot of salt! Return the fried paneer to the pan, heat through, and serve. This would be fantastic served with Tandoori Chicken and/or with my low carb Naan Bread!!! 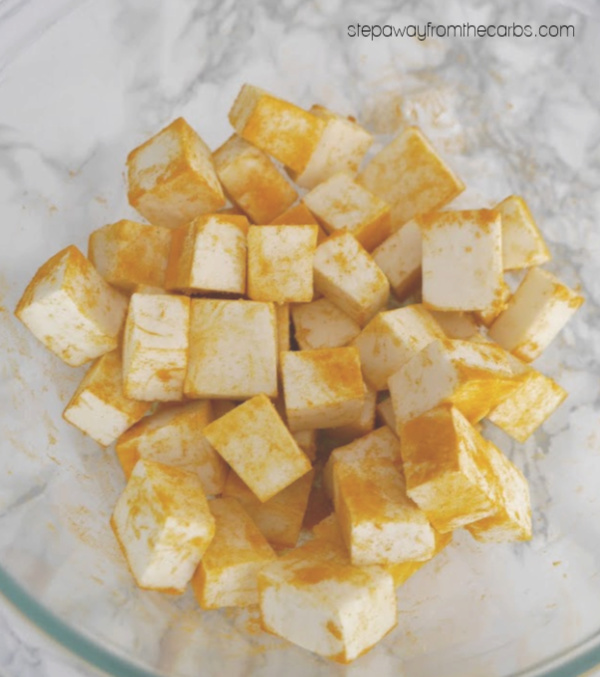 Place the cubes of paneer in a bowl, and add turmeric and salt, then mix well. 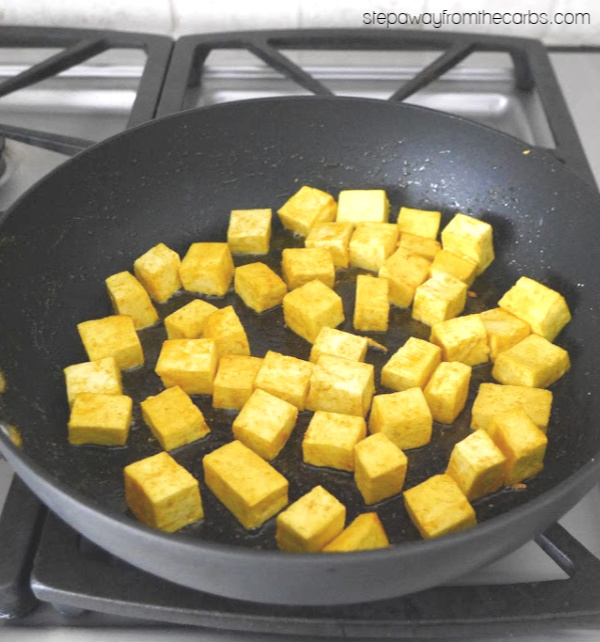 Remove the paneer with a slotted spoon - keeping the oil in the pan - and transfer the cubes to a bowl. Set aside. Add more oil if necessary, then prepare the spice blend by adding garlic paste, onion powder, ground cumin, and garam masala. Cook for a few minutes, stirring frequently, then add some water to make a loose paste. Add two boxes of chopped frozen spinach, and reduce the heat to low. Let the spinach defrost, stirring as it thaws. When the spinach has fully defrosted, turn up the heat and boil off any excess liquid. Taste for seasoning and add salt and pepper. You'll probably need a lot of salt!